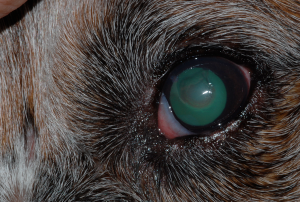 Corneal ulcers are a common eye problem for cats and dogs. In addition to treating an ulcer with a topical antibiotic, artificial tear supplement and pain medication, adding a tetracycline drug can aid healing. Tetracycline drugs function as more than just an antibiotic. They also function as antiproteases and enhance the epithelialization of corneal ulcers. Tetracyclines (doxycycline, minocycline, oxytetracycline [Terramycin]) have anti-collagenase effects and anti-inflammatory effects on the ocular surface. Tetracyclines have been shown to inhibit matrix metalloproteinases produced by the corneal epithelium. Matrix metalloproteases promote collagenolysis which can lead to melting ulcers and globe rupture. 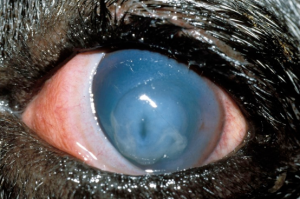 Therefore, tetracyclines are often used to treat corneal stromal ulceration and melting or infected ulcers. 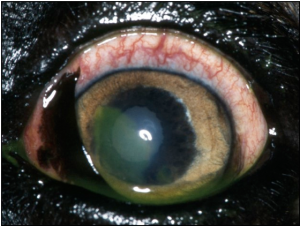 Tetracyclines also increase transforming growth factor-beta expression which can increase the production of corneal epithelial migration factors. 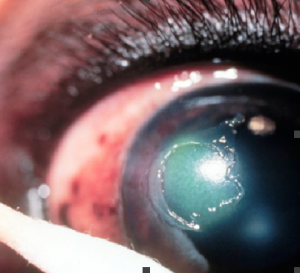 Problems with corneal epithelial migration may contribute to slow healing ulcers. 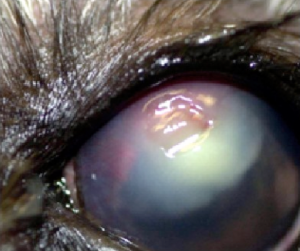 Tetracyclines are often used to treat recurrent or persistent corneal erosions in people, indolent ulcers in dogs, and herpes related geographic ulcers in cats. The dose for oral doxycycline or minocycline is 10mg/kg PO once daily. Topical oxytetracycline is often used one to four times daily. Tetracyclines are beneficial for all types of ulcers. I generally use either a topical or oral route of administration depending on the client preference and patient tolerance.